I got some words from my partner in artistic crime, Brian Sanchez. 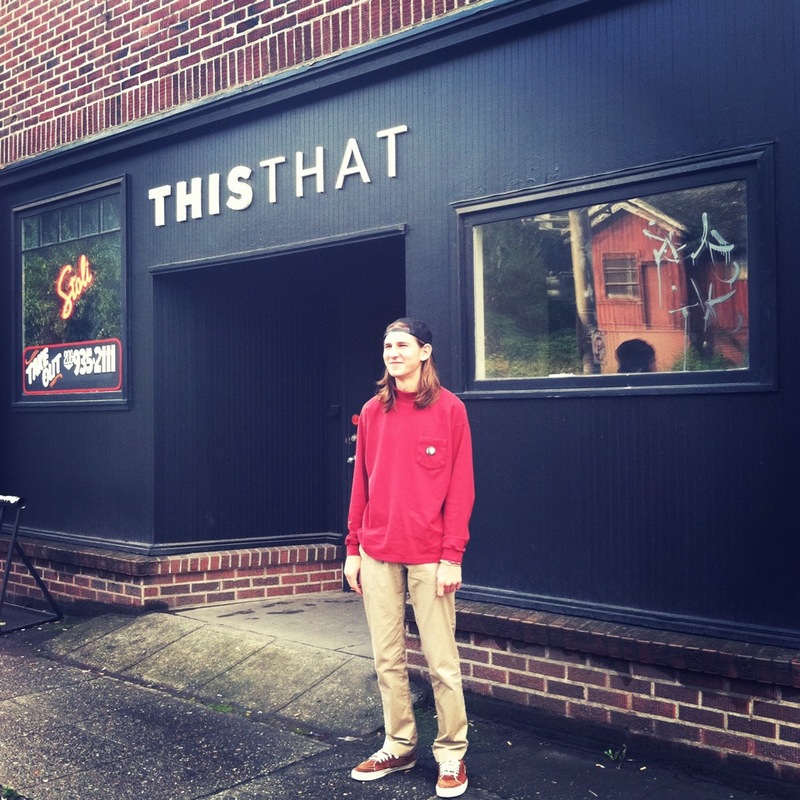 Talking about his show this saturday, for the opening of the graphic design and screen printing studio, THIS THAT. Also included is an interview with Eric Hodgins, Creative Director of This That. This is not something to miss, and if u do, shame shame shame. DD I’m staring at your massive 17 x 35 mural over at THIS THAT. This is the biggest thing you’ve done yet! How much time has gone into this and what has the process been like to bring it all together? BS The mural we are currently painting will be, by far, the most detailed work I’ve done on this scale. So far I have been working for five 16-hour days which consists of painting from the a.m. to the a.m. of the next day then sleeping for a few hours then waking up and painting as long as I can. It sounds gnarlier then it really is , but I am very impatient and need the gratification of watching it get closer to completion each session. I think that’s how most muralists work. Their are so many things that could happen in between my daily routine and the times I get to paint , that I would hate for some freak accident to occur and not allow me to finish. My solution is binge painting…… and I love it !!!! 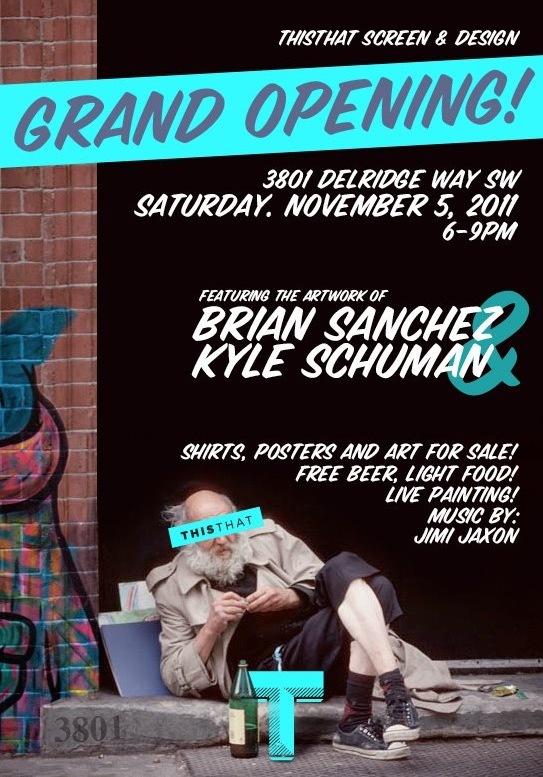 DD Kyle Schuman will also be featuring a mural of Bill Gates. Together with me DJ’ing, we’ve got this little crew going. Last time we all worked together was the True Love Art Gallery opening on Capitol Hill. Talk a bit about Kyle’s skills..
BS Kyle is a 17 year old Manchild reigning from the yawn capital of Washington, the ever so boring suburbs of Everett . He has more talent then I have ever seen in a person his age , including a hunger for originality and a style of his own . We have been working together on a regular basis for the last 4 or 5 months and continually have a good time. That’s it really , we have fun when we paint and when we hangout , so I plan on collaborating with him as long as I can. As far as what we ( Kyle, Jimi , and I ) got going on , that is something I also cherish. It’s been natural , it’s been successful , and it’s been a good time !!!! Let’s do this forever!!!!!!!! DD The opening for THIS THAT will feature a huge art showcase/party with music, murals, clothing design etc. What do you hope people take from the night? EH ThisThat is not only a showcase of what we can do, but who we surround ourselves with. From local clothing lines to coffee shops to youth non profit organizations we interact with a wide range of clients. We enjoy screen printing and along the same lines we enjoy art music, culture and community and our shop launch is a celebration of all of that. DD How did you hook up with Brian and Kyle? How does it feel to have their art become a permanent fixture of the THSTHT building? EH We met Brian and Kyle through a mutual friend. We knew we wanted big murals in our shop but weren’t sure of exactly what we wanted on the walls. 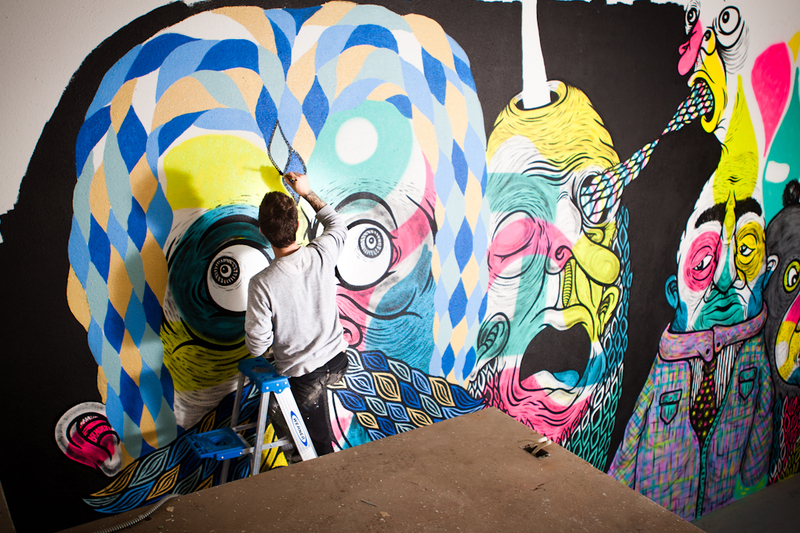 We wanted to work with artist that had their own style, vision and wanted to treat our walls as their blank canvases. After one meeting we realized these two were exactly what we were looking for. Having their art be a permanent fixture on the shop walls of ThisThat isn’t about us having cool murals. Its about giving creative freedom to local talent and a daily reminder that we love what we do.